The 2015 Corvette Stingray may be the performance bargain of the century, but it’s still an expensive machine for the average person. Not all of us can justify spending $60,000 or more on a new two-seater sports car, but what if you only had to spend $10 on it? 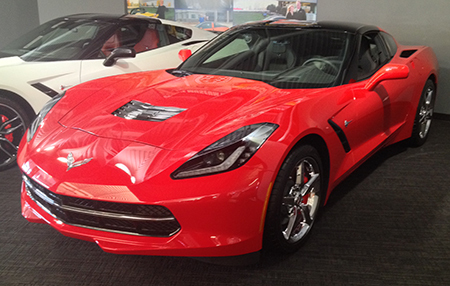 The National Corvette Museum is currently selling raffle tickets for a brand new Torch Red 2015 C7 Corvette Stingray, which isn’t news. The NCM is constantly selling raffle tickets for $100 or more in order to raise money for their day-to-day operations, but the tickets for one particular Stingray to be raffled are just $10. There’s a small catch. When tickets are $100, they usually limit sales to around 2,000 tickets or so. But because tickets for their Torch Red Stingray are just $10, hopeful Corvette fans are allowed to buy up as many as they want, dwindling the chances of your ticket number being called. Even if your chances are smaller than usual, we’d say it’s still worth it to buy up a ticket or three. The money goes to supporting the NCM, and you’re entered to win a brand new C7 with General Motors’ new eight-speed automatic transmission, the 2LT equipment package, a Performance Data Recorder and more. Sounds like a win-win situation to us. Follow this link for more info. Make sure you read the rules & regulations. Winner agrees to pay 25% federal income tax withholding to the National Corvette Museum prior to release of the Corvette. So, better make sure you can get access to $17,000 before showing up to claim your prize! Or you could take the cash Prize and have the taxes deducted from that. They are making a killing on this raffle, That’s about $300,000 in ticket sales and they ship you a vette. Nice. Now if I could only do that. And this goes to show how the federal govt has their dirty hands in EVERYTHING.